From Edison's invention of the phonograph through contemporary field recording and sound installation, artists have become attracted to those domains against which music has always defined itself: noise, silence, and environmental sound. Christoph Cox argues that these developments in the sonic arts are not only aesthetically but also philosophically significant, revealing sound to be a continuous material flow to which human expressions contribute but which precedes and exceeds those expressions. Cox shows how, over the course of the twentieth and twenty-first centuries, philosophers and sonic artists have explored this "sonic flux." 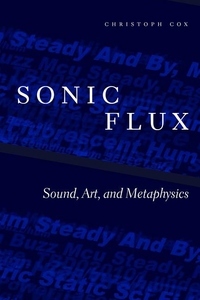 Through the philosophical analysis of works by John Cage, Maryanne Amacher, Max Neuhaus, Christian Marclay, and many others, Sonic Flux contributes to the development of a materialist metaphysics and poses a challenge to the prevailing positions in cultural theory, proposing a realist and materialist aesthetics able to account not only for sonic art but for artistic production in general.